Alphablog: X isn’t for Christmas! I know I’ve forced a round peg in a square hole but, although I object to when people use the term ‘Xmas’ instead of ‘Christmas’ (as a Christian I find it misses the point and replaces the meaning of Christmas with something generic), I was a little stuck and it gives me a nice opportunity to get festive! So having said my piece above, to get us into the Christmas spirit I’ve selected 10 of my favourite Christmas based creative solutions! Although not a ‘design’ as such, this has pulled on our heartstrings and got the nation talking. The cute boy who we all assume can’t wait to tear into his prezzies on Christmas morning surprises us all with his ulterior motive. Is there anything that hasn’t been ‘Pantoned’? 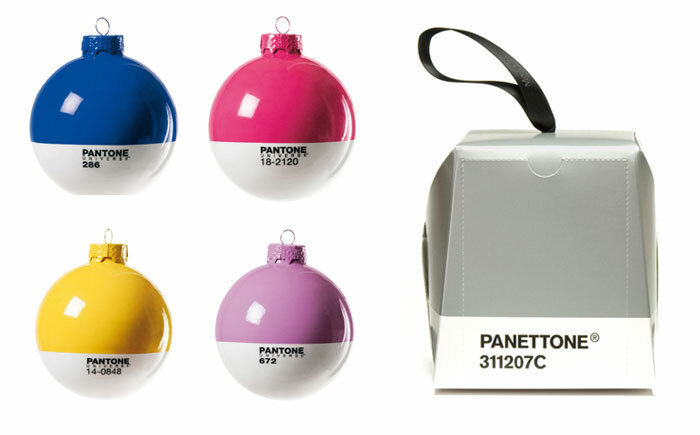 Christmas is an ideal opportunity to utilise the nerdy appeal of Pantone’s recognisable branding, and these baubles do so brilliantly. An even cleverer translation is the application to the traditional Christmas Panettone cake – a couple of tweaked letters later you’ve got a delicious little pun. A very clever little idea for a corporate Christmas card. The understated look of the front is blown away by the beautifully engineered pop up snowflake formed by the famous VW badge. 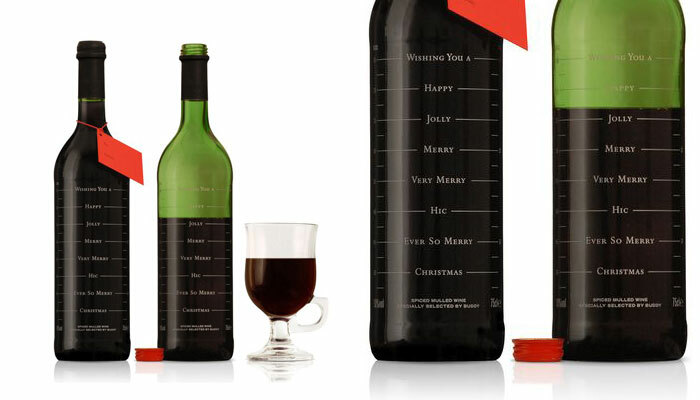 Exeter based design duo Buddy gave their clients a cheerful gift for Christmas – a bottle of mulled wine which, the more you drank, the merrier the message (*hic*)! 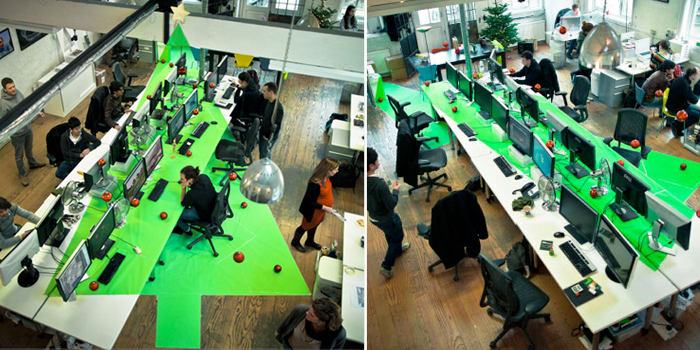 Transforming their office into a festive anamorph gave Squint/Opera a unique and memorable image for the front of their Christmas card. 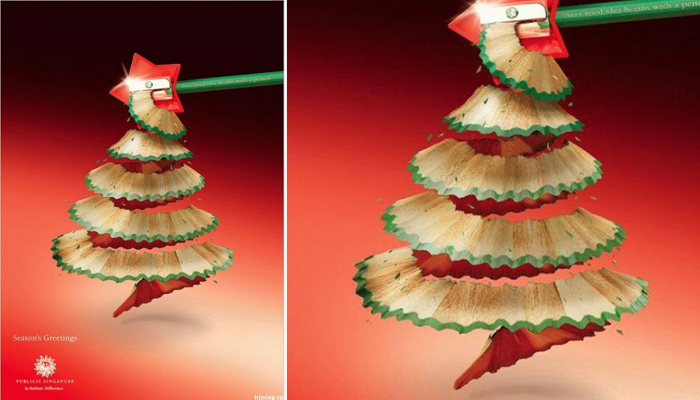 What better solution could there be for a communication/advertising agency Christmas ad than this? Why no-one’s thought of it before is beyond me! Must have taken a lot of patience to create though! 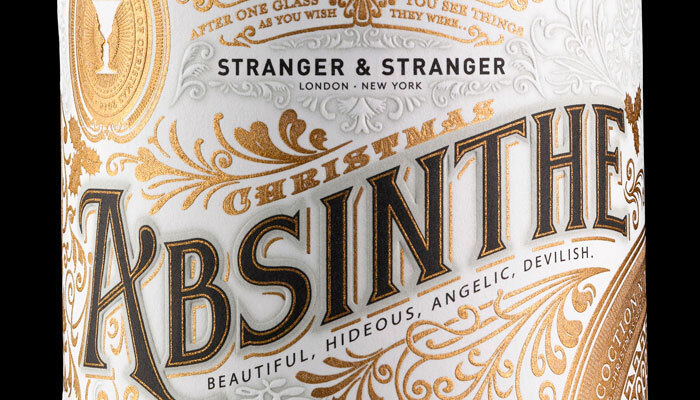 For sheer elaborate decoration these special edition Christmas booze bottles really are stunning. 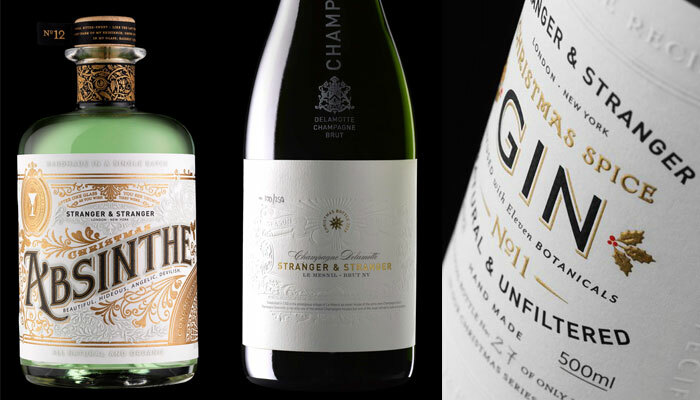 In reality, a specialist drinks packaging agency has no excuse for producing lousy Christmas gifts but these go above and beyond – particularly 2010′s Absynthe. Beautiful. “Holidays are coming…”. When that lorry starts making its way across our screens and the music fades in we all know we can legitimately start thinking about Christmas! The company that pretty much branded Christmas as we know it has a huge influence on our festive arrangements. Another Pantone themed entry (see no. 9) but one I felt was deserving of its own place in the list. 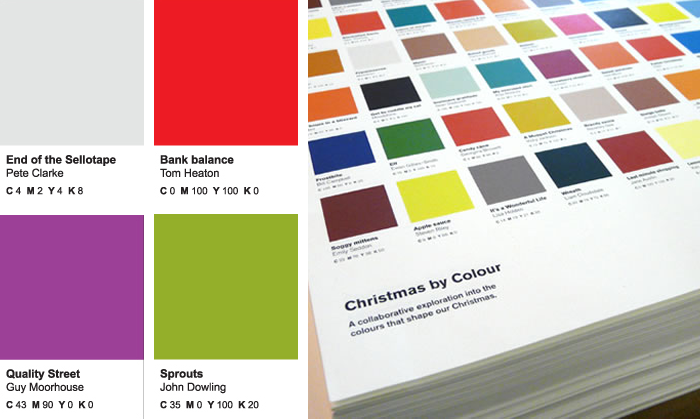 Christmas by Colour was a collaborative project in 2008 whereby people suggested colours that summed up their view of Christmas, a selection of which were printed on a limited edition A1 poster and Christmas cards. Some of my favourites included End of the ‘Sellotape’, ‘Freezing Face’ and a rather queezy green ‘The morning after’! This really amuses me! 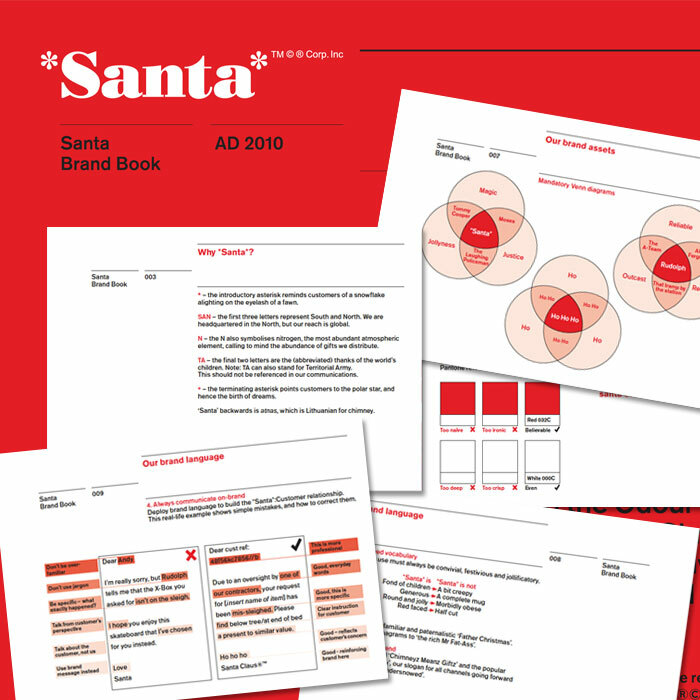 A faux brand book for *Santa* went viral in December 2010, adding a dash of corporate hilarity to the ‘concept’ of Christmas. 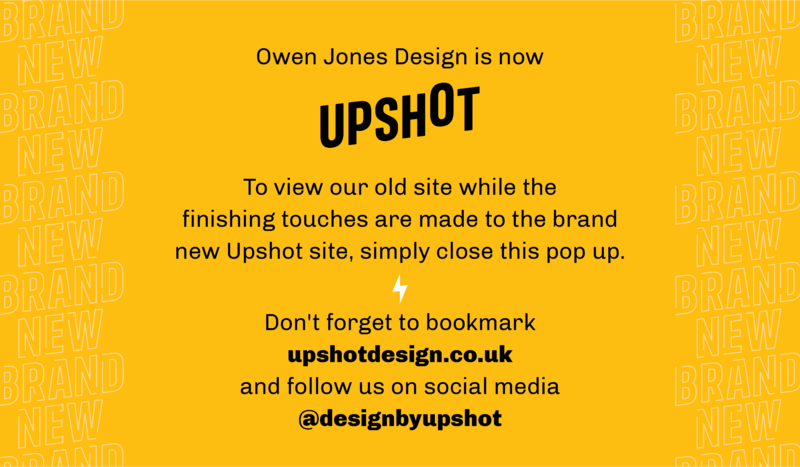 Approved colours, language and imagery are all included; I can only really recommend you check out the pdf here on Quiet Room’s website and if you enjoy it as much as I did you’ll be forwarding it straight round to your friends! I hope that gives a nice sprinkling of festive spirit as we begin elbowing our way through late night shopping for the next few weeks! Which is your favourite? If you've seen better or similarly brilliant examples of Christmas design feel free to let me know.